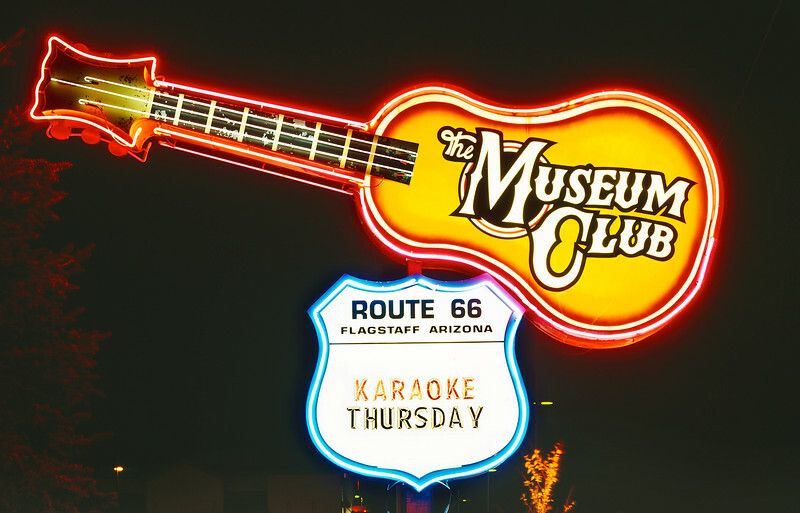 The Museum Club on Route 66 in Flagstaff has been an institution for several decades. 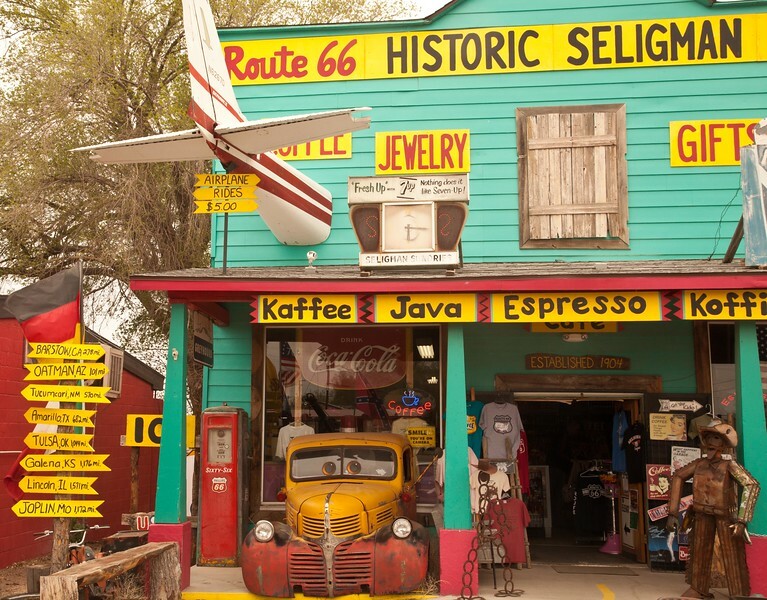 Hackberry, just East of Kingman, AZ is a must stop for tourists. 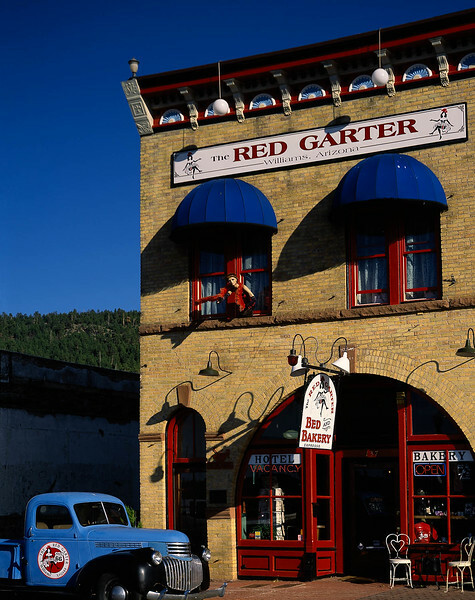 The Red Garter in Williams, AZ started out as a brothel over a hundred years ago. 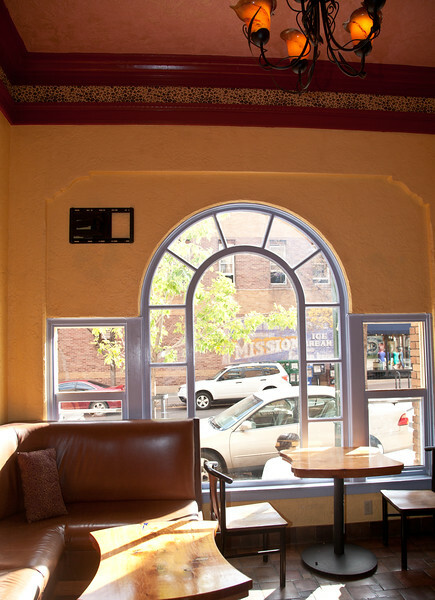 Now it is a comfortable bed & breakfast, with a nice, friendly bakery downstairs. The clothes on the second story mannequin (Womenequin?) are changed regularly, but she always manages to attract attention. A refurbished caboose in the Williams train yard. 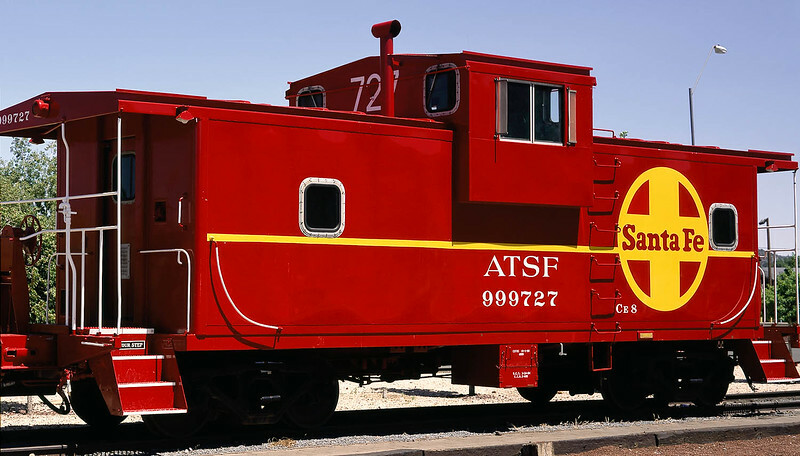 The caboose really was this bright color. Trains are an important part of Route 66 since a major national mainline runs next to the highway. Elvis in the driver's seat of an old DeSoto. 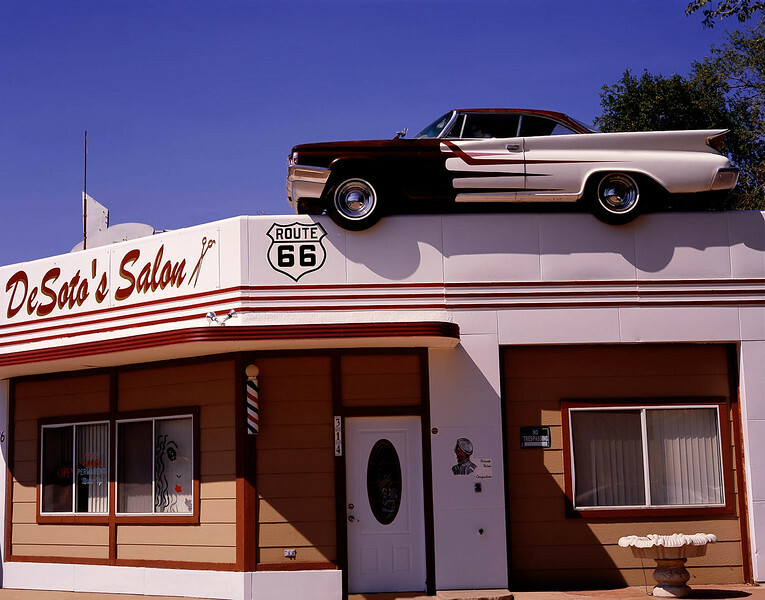 Old cars on roofs, and Elvis are staples of Route 66. 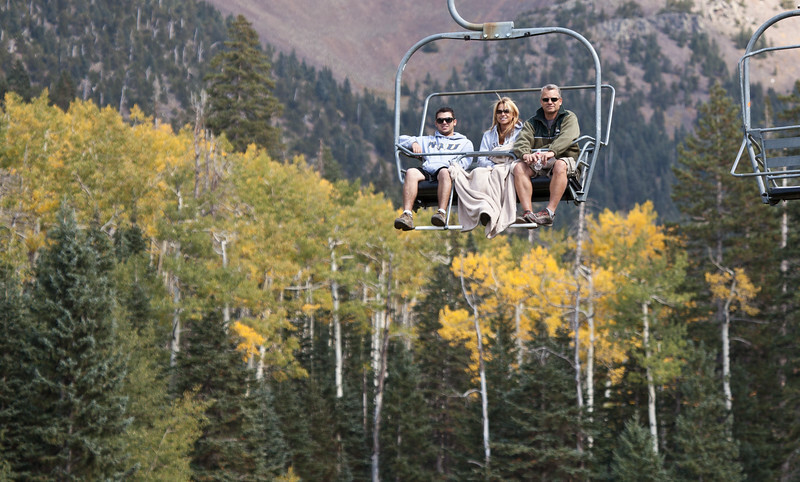 Edie DeSoto and her husband wanted to escape the hectic city and move to a small town. They purchased what had previously been a gas station and storage facility for junk. 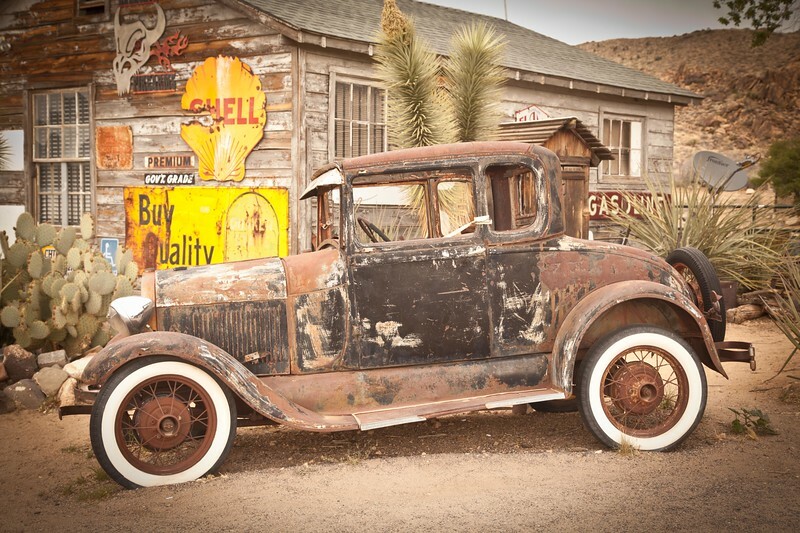 When they went over to sign the papers to buy the old building they noticed an old beat up Desoto in the back yard and they purchased it for $1. They painted the car in the same color scheme as the building and a friend with a forklift put it on the roof of the building. 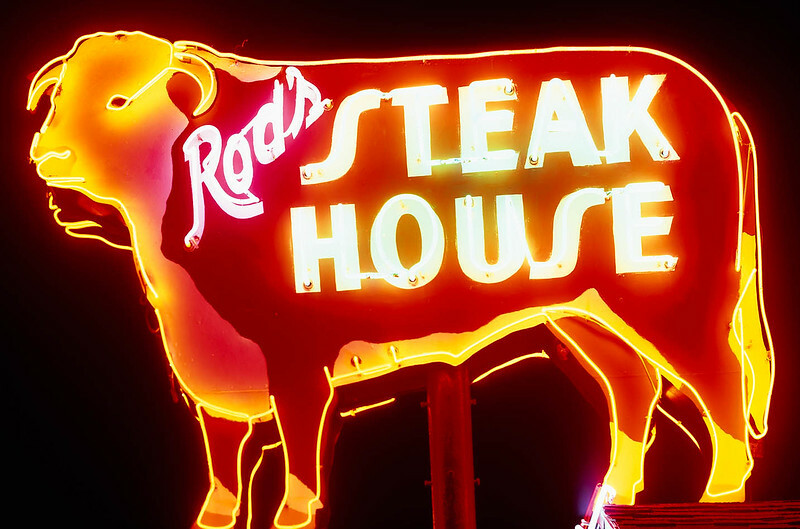 A few decades ago, Rod's Steakhouse was the only thing going on in Williams, AZ. 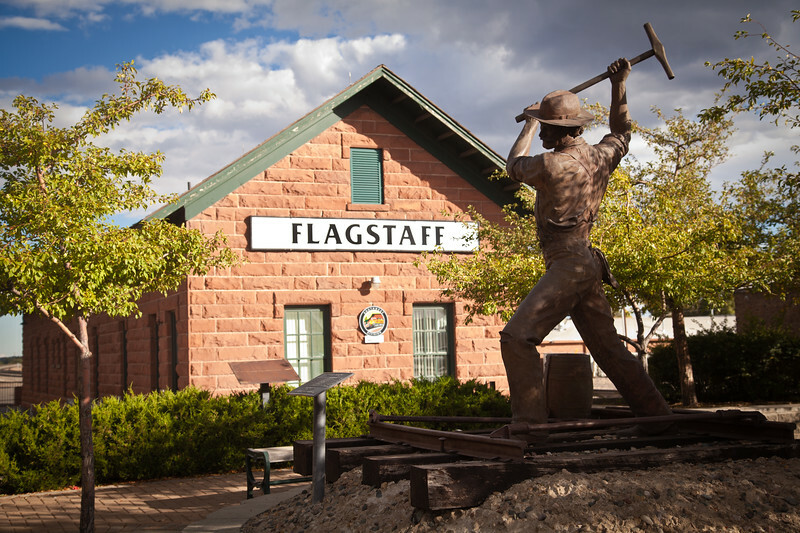 Now that the Grand Canyon Railway has started transporting people from Williams to the Grand Canyon, the town has come fully back to life. I can say without fear of contradiction: Rod's Steakhouse has the best prime rib I have ever had. 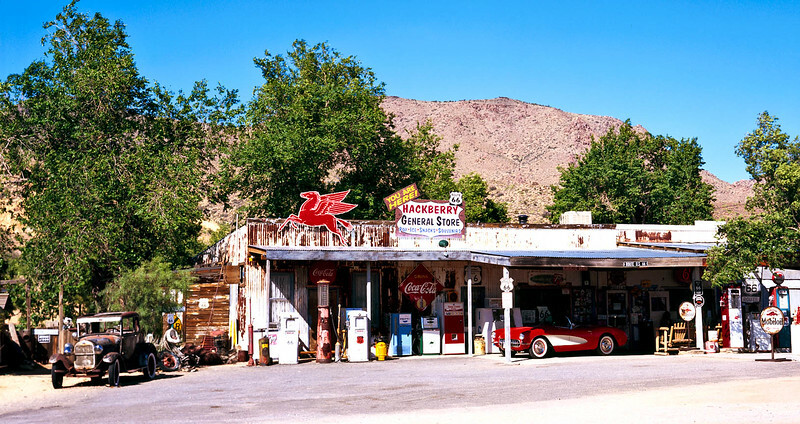 The animated movie "Cars" was inspired by and takes place on Route 66 through Arizona. This Williams institution and the car were featured in the movie. 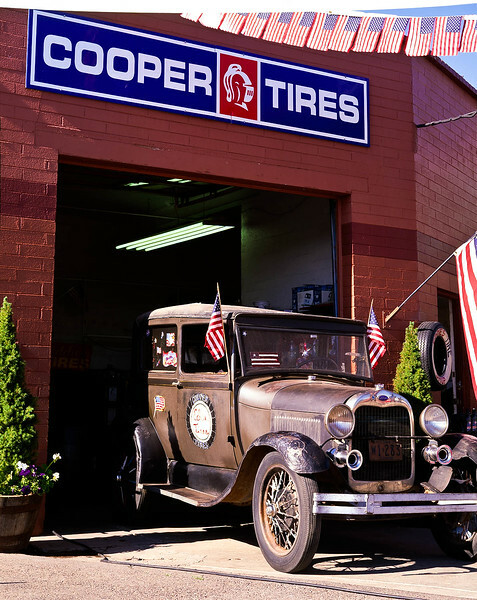 The tire store and gas station is also home to allegedly the world's largest ball of bumper stickers. Every time the owner gets a new bumper sticker, he slaps it on the ball, which is now approaching a diameter of 3 feet and is quite heavy. 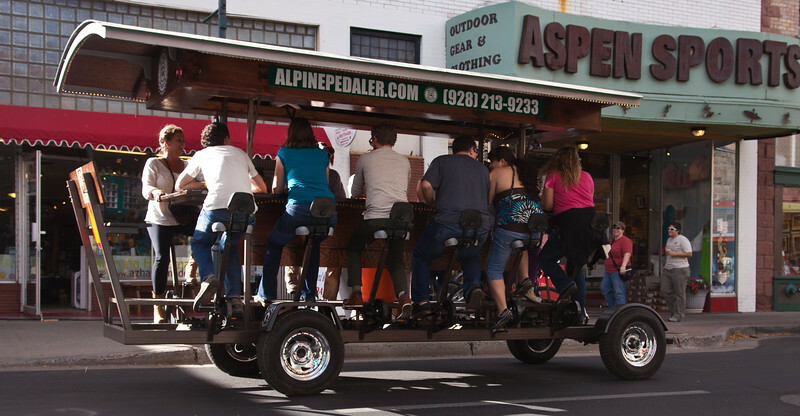 Where else but Route 66? 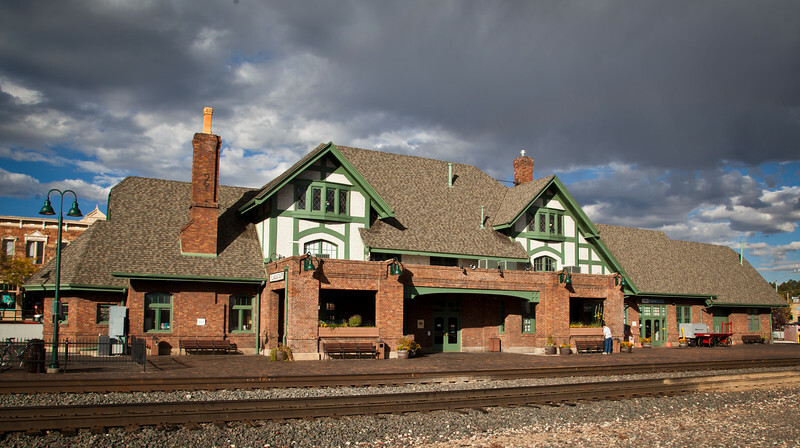 The Amtrac passenger station in Flagstaff, AZ, right on route 66, October, 2012. The sun was coming in below the storm clouds building up. 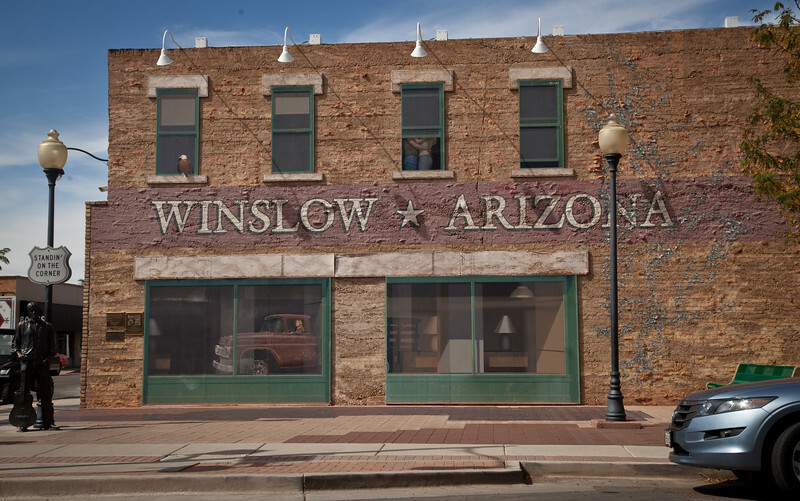 Standin on the Corner in Winslow, AZ, on Route 66. This scene commemorates the Eagles song of the same name. 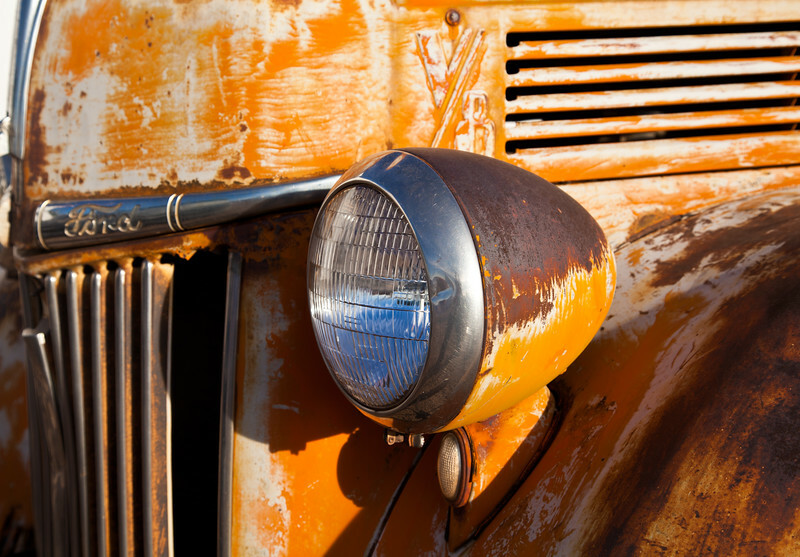 This 1940's Ford truck is parked at the Wigwam Hotel in Holbrook, AZ. 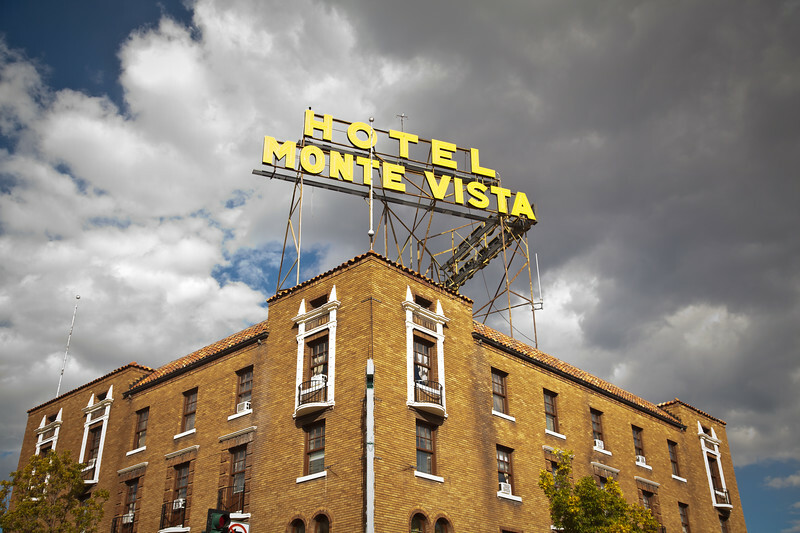 The hotel is on the National Historic Register. 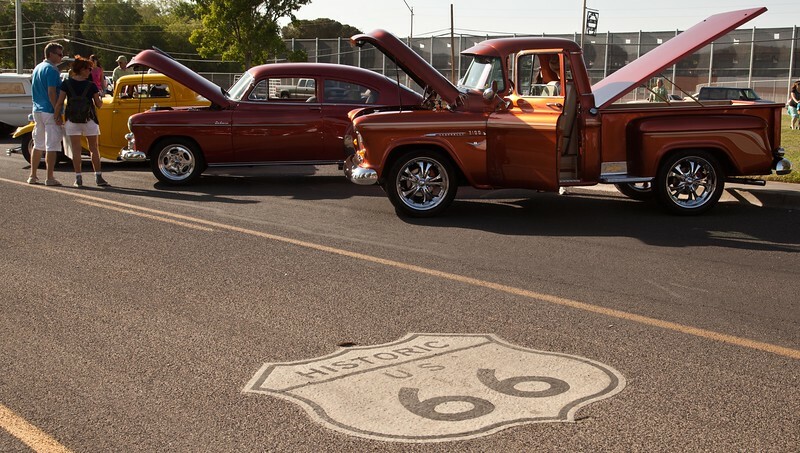 Car shows are a staple of Route 66. This was at the Williams train station. The food and weather were great. 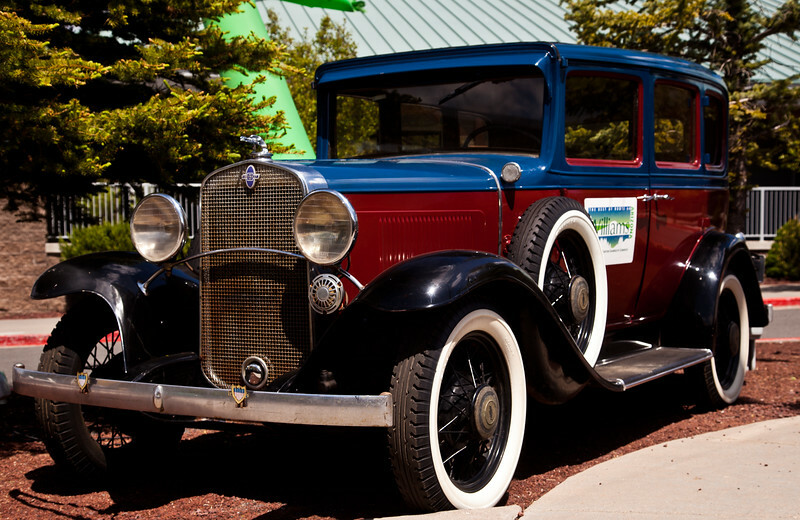 An old Chevrolet at a car show at the station of the Grand Canyon Railway in Williams, AZ. 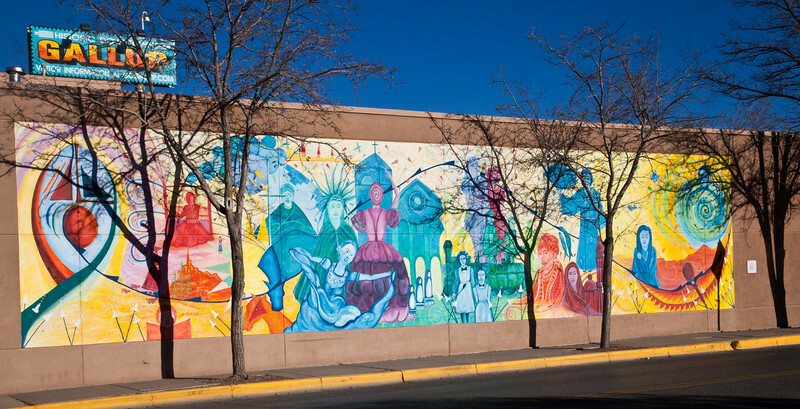 A wall mural on the Children's Library in downtown Gallup, New Mexico. The downtown area has been fixed up and remodeled so it is a very pleasant area. There are several murals in the newly improved downtown area. 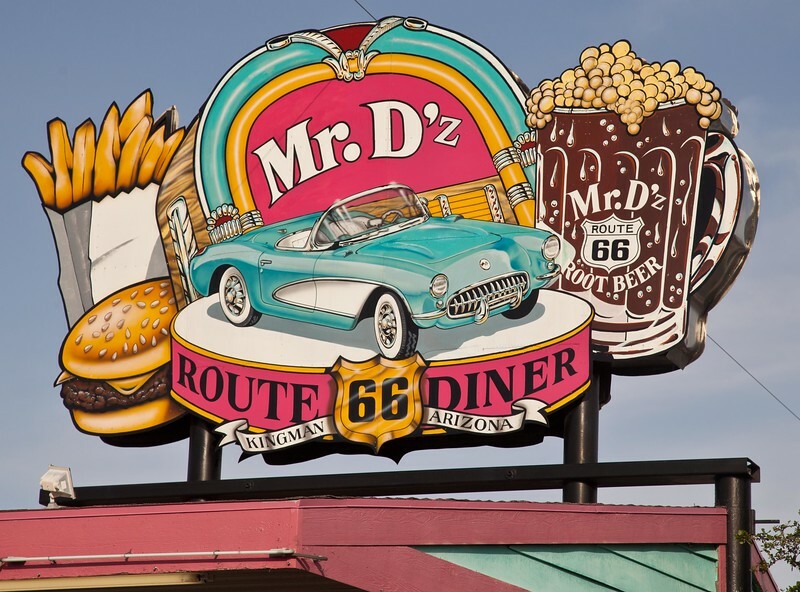 This colorful sign was on the New Mexico side of the Arizona/New Mexico state line, and seemed to capture the feel of Route 66 for the next several miles. Frank Yellowhorse, standing in front of the business his grandfather built in 1935. 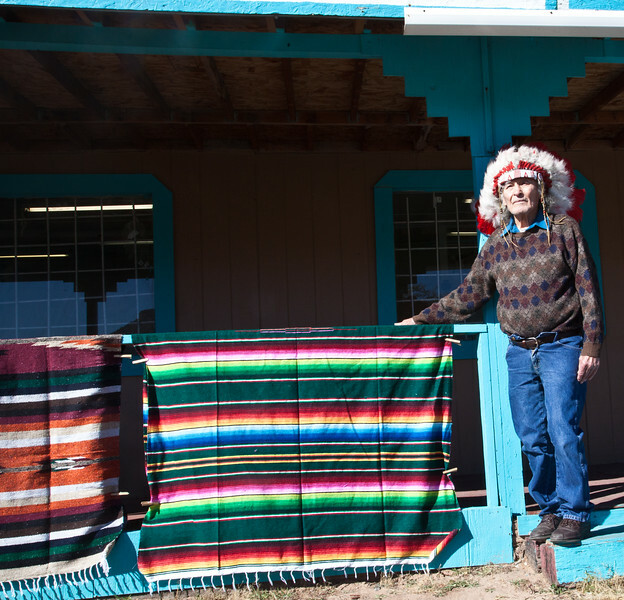 Frank and his 2 brothers were veterans of the Korean War, so the Navajo Nation helped them build the business. The oldest of the brothers is Juan Yellowhorse, and since he is the oldest member of the family, people refer to him as Chief Yellowhorse, even though the Navajo Nation has a regular government and no longer has chiefs. Another view of the Padre Canyon Bridge built in 1914. The ends of the bridge have the Route 66 insignia. The bridge was very narrow and in serious decay. Still I drove over the bridge and continued on my trip along Route 66. The highway had fallen into such disrepair, a 4 wheel drive was required. 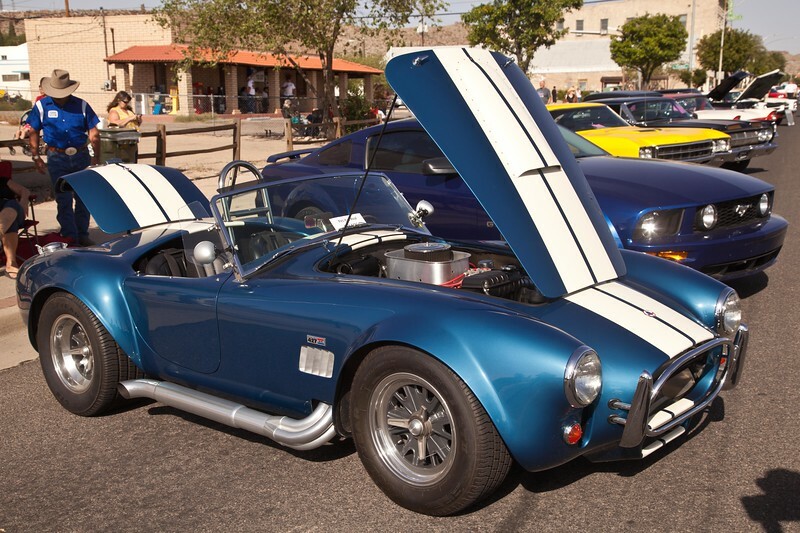 This is an original 427 Shelby Cobra. Carol Shelby signed the glove box, and a panel in the trunk. 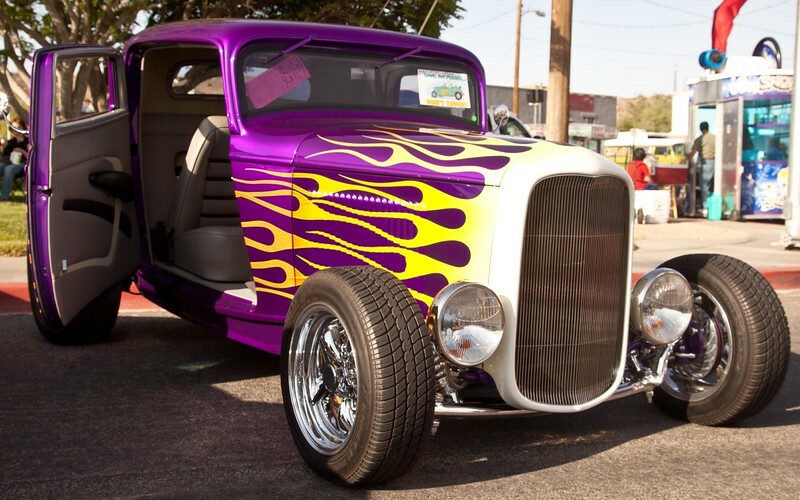 Hot Rods were the stars of the 2013 Fun Run in Kingman, AZ. 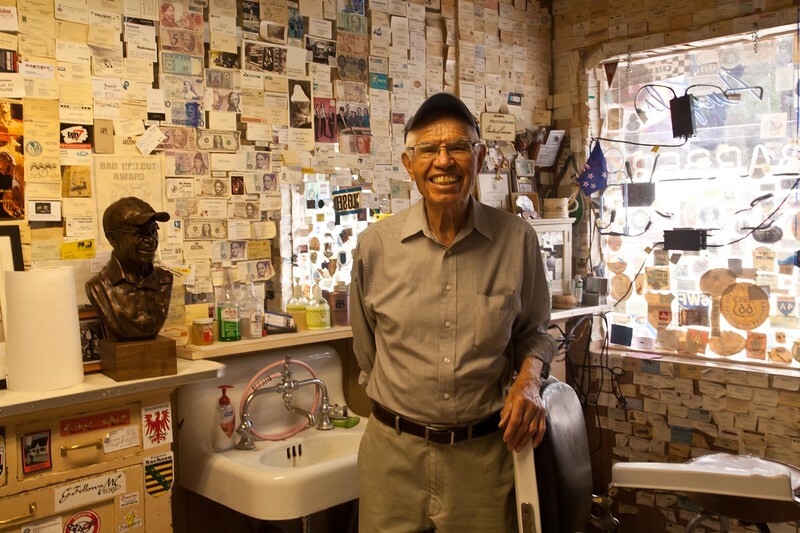 Angel Delgadillo's gift shop and barber shop in Seligman, AZ, turned in to a bit of a shrine to the rebirth of Route 66. 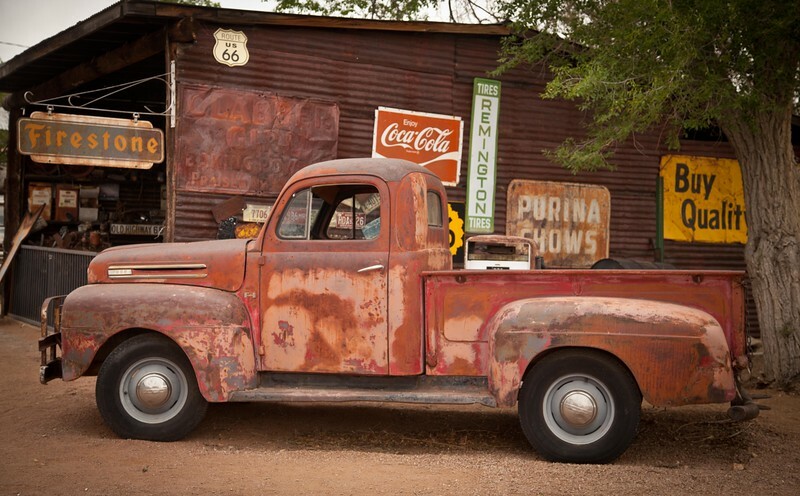 One of the scenes around the Hackberry General Store. 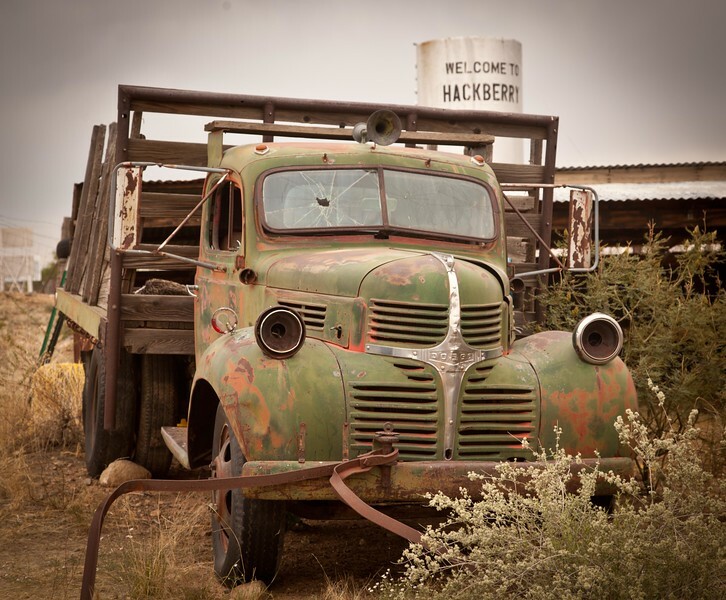 The Hackberry General Store is the downtown of Hackberry, AZ. 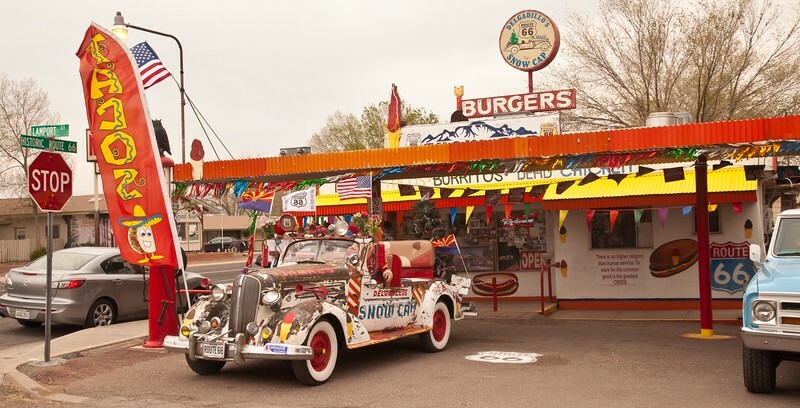 This is a fun, whimsical store celebrating everything Route 66, Elvis, old cars, and pretty girls. Hackberry is 23 miles East of Kingman. One of the things that comes to mind when somebody thinks about Route 66 is the Car Shows. 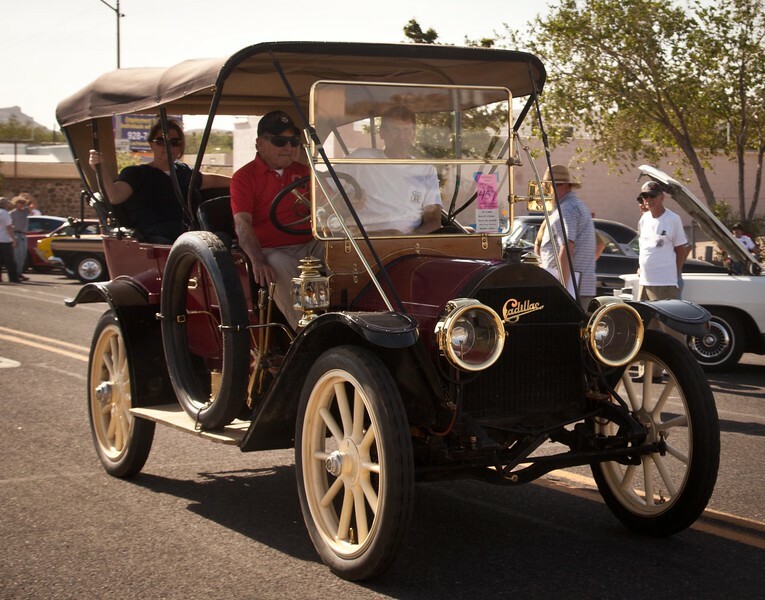 This was the 26th Annual Fun Run in Kingman, AZ, May 2013. This 1941 Chevy Woody really caught my eye at the 2013 Fun Run car show in Kingman, AZ.